Preface This book has been meant for the students who are appearing for M.S. Botany Entrance Examination of various Indian Universities. This book is also useful for other competitive examination such as UGC-NET/SET/UPSC and state service. 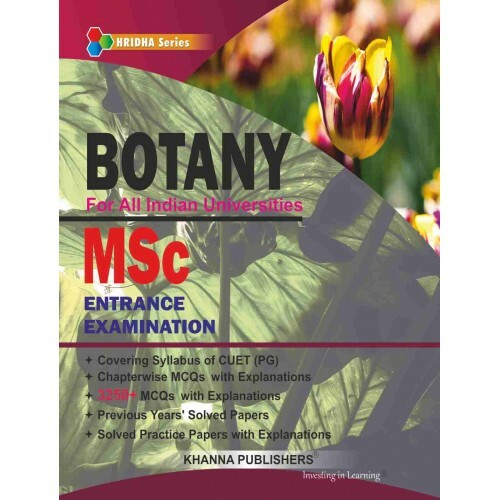 This text deals with the important field of plant science, namely Cell Biology, Plant Physiology, Ecology, Genetics, Plant Diversity, Methods of Reproduction, Plant Pathology, Biodiversity and Origin Life, and Evolution, etc. The main purpose of the book is to show some of the educational possibilities offered by plants of every day use, and at the same time to guide beginners to such general ideas about plants as should form part of a liberal education. There are a number of plants represent all parts of the vegetable kingdom, they are the very ones about which most persons have the greatest desire to learn and they are mainly the ones which were first studied by mankind. This book helps the beginner, therefore, to learn at the outset as much about these economic plants as he is ready for, then help him to classify them scientifically, and he will be prepared to appreciate that wider view of the life of plants which inspires botany today. SALIENT FEATURES *Key-terms given at the beginning of each chapter *Sum-up given at the end of every chapter *Did you know and Concept quiz given in each chapter *More than 2500 Objective Questions *Two solved Model Test Papers *Two solved Previous Years Question Papers *Two unsolved practice papers. Although every attempt has been made to make this book student friendly. In conclusion. we wish to acknowledge most gratefully the helpful criticisms and suggestions received from teachers and students during the progress of the work. Any suggestions made by the students to improve the usefulness of the book are welcomed.